This is a great kumihimo project suitable even if it is your first kumihimo project. The 12 page copyrighted manual assumes no prior experience and is easy to follow with step by step directions with lots of pictures. It is a PDF available online. Access to the PDF is included in the kit. Each kit comes with a pre-cut and ready to braid cord bundle tied together ready to be inserted into the kumihimo disk so you can start braiding right away. 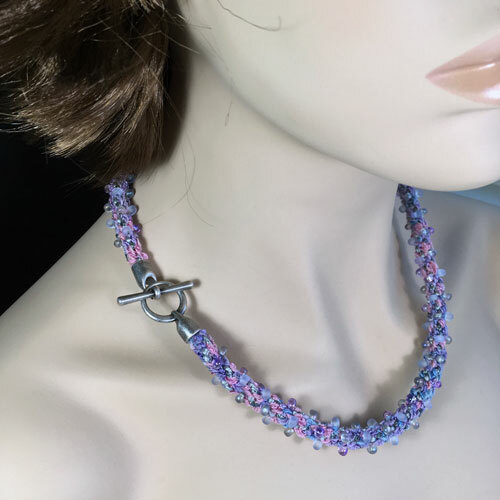 It includes hand dyed silk ribbon, metallic accent cords, satin cords, and C-Lon Bead Cord. 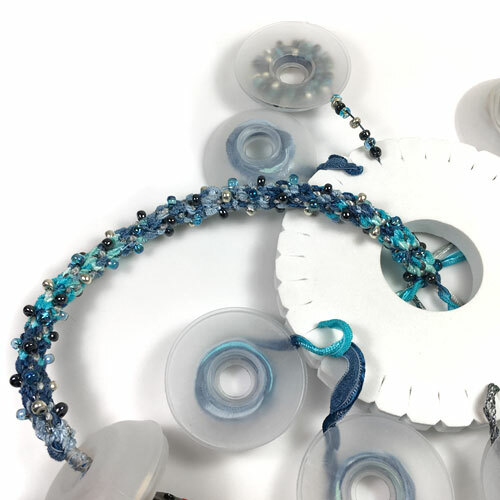 Three colors of 4mm Magatamas and the toggle clasp are assorted for each colorway. The length of the finished braided cord is approximately 21 to 23 inches (54-59 cm) long and 6-8 mm in diameter. The 4mm Magatamas add width to the cord bringing it up to 12 mm in diameter. Want more length? 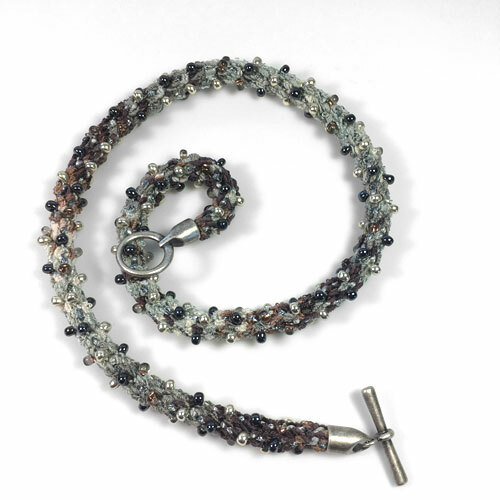 Combine 2 kits for a longer necklace with two clasps. 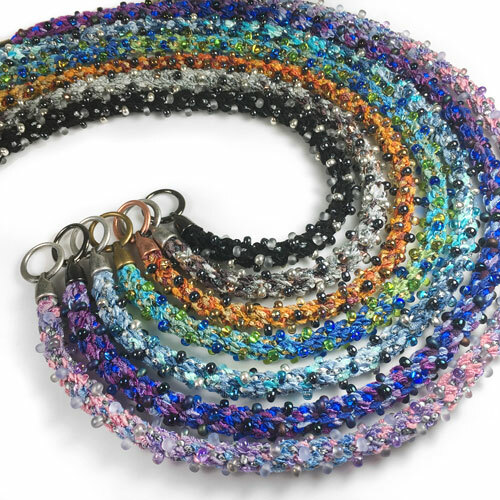 Want to make bracelets? 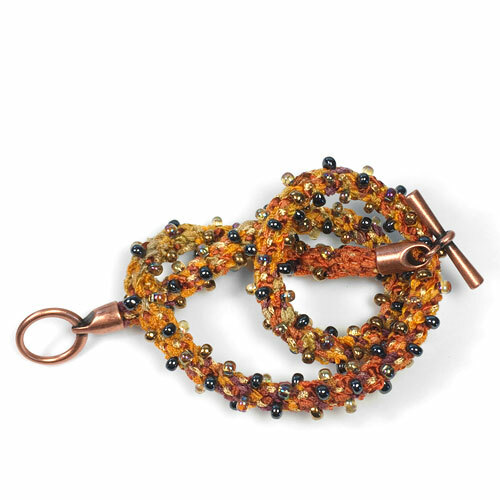 Most of the kits will make double wrap bracelet or several single wrap bracelets > Just get more toggle clasps for the extra bracelets. 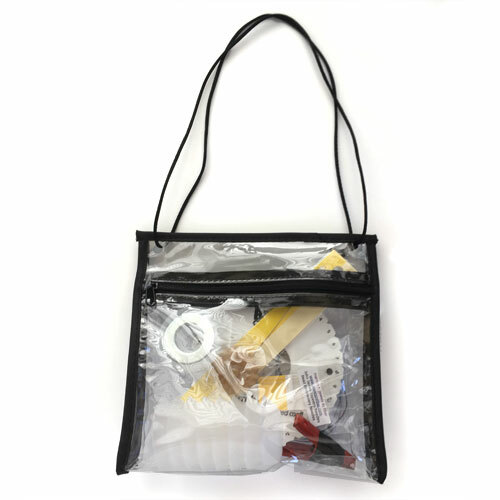 For this project, get a Kumihimo Tool Bag with a Mini K-Disk, 8 EZ-Bobs, 1 Weighted EZ-Bob and 1 Mini-Clamp. Plus you will also need a pair of scissors, micro-tip pruning snip, and adhesives to attach the toggle clasp such as Poly Zap Super Glue and either Zap Jewelry Gel or Devcon 5-Minute Epoxy. 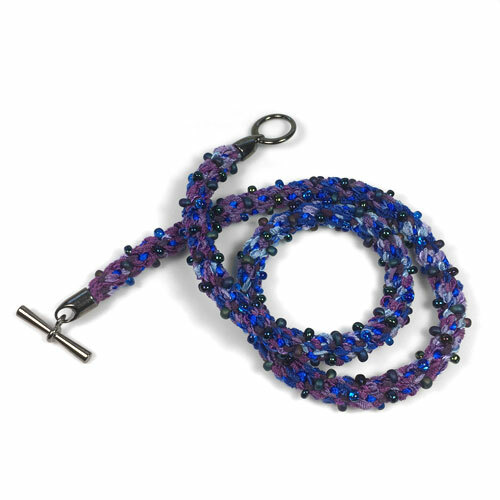 The larger bag comes with a bead mat, a nice addition to keep your beads from moving. The tutorial is also available by itself HERE. 12 page PDF document with over 30 pictures and tables. This will take you directly to a Paypal checkout payable with any major credit or debit card. Once your payment is complete you will be redirected to a web page with the link to the PDF and the password. Save the password and bookmark the page for future viewing. Please Note: These instructions are copyrighted and are for personal use only. If you would like to use these instructions to teach, either buy a set of instructions per student or a kit for each student. Do not duplicate this document either in print or in an electronic manner. When purchasing this PDF, it is assumed that you agree with the terms of the copyright of this document. 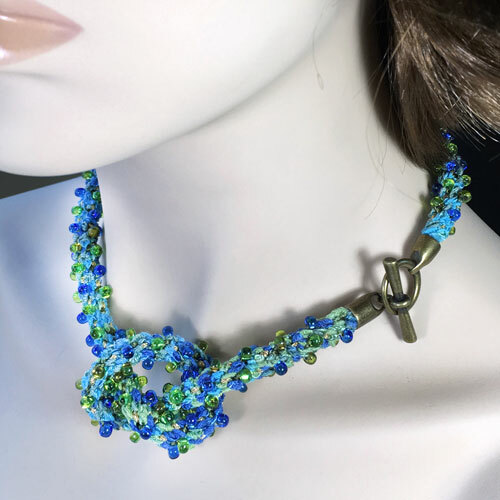 As to necklaces or bracelets, make as many as you wish, but if you use the designs in the PDF as is, without any changes, assign the design credit to Marion Jewels in Fiber. Sorry, no refund on PDFs. Thanks for understanding!